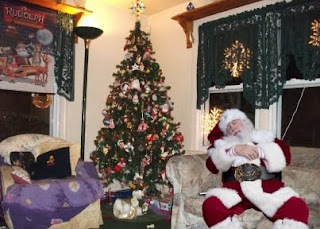 For $9.99 and three easy steps, you can upload a holiday photo, add Santa, and print the proof. You can also share your photo via email, Facebook, or Twitter. When you are ready to add Santa to your photo, you have numerous poses to choose from. You also have the ability to edit your photo. You can zoom in on your background, as well as adjust the size, color, brightness, and position of Santa. 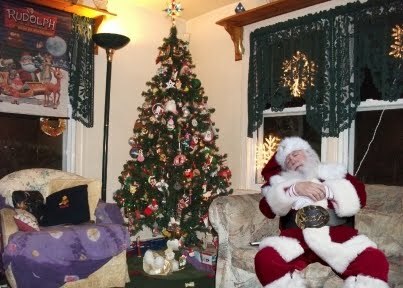 Last year I caught Santa with my digital camera and quickly uploaded the picture to my computer (or so my kids thought). They were so excited to see that Santa really was here and they found it very amusing that he even took a nap on our couch. This year, your kids can be just as excited because I have not 1, but 5 codes to giveaway! And don't worry if you're not one of the lucky 5. I have something for you, too. If you want to catch Santa in the act, just enter LOVE at the checkout to receive 25% off your purchase. Contest ends Wednesday, December 23 at 9pm EST.